Pontoon boats come in a range of different sizes but for those looking for a pontoon boat for fishing, then you will want something small and inflatable but with plenty of aids such as rod holders, comfortable seating and plenty of storage. The best one man pontoon boat is the Classic Accessories Colorado, which is constructed of an abrasion resistant PVC and has an outboard motor mounting at the rear for those wanting to install a small outboard or trolling motor for easy cruising. With many of the mini pontoon boats, you have the choice to add a small outboard motor or a powerful trolling motor. This is something that is not possible with the next alternative, which would be a cheaper float tube. There is a wide range of styles of mini pontoon boats but the inflatable construction is the preferred option. This is due to the fact that they can be dismantled and deflated with ease as well as being much cheaper than a rigid bodied alternative. The majority of people who are going to buy small pontoon boats are fishermen. Therefore its crucial that the brands offer a range of specific features that are targeted towards fishing with the likes of rod holders, storage and much more. If you have the budget and can afford a mini pontoon boat over a fishing float tube, then its a much better investment in the long run. Below is a list of the best mini pontoon boats that have been designed for fishermen. If you are looking for the best alternative to an inflatable boat, an inflatable pontoon boat is something to think about. This Classic Accessories Colorado is the best inflatable pontoon boat on the market today and even has an outboard motor mounting at the rear. This is a heavy duty pontoon boat which is perfect for shallow waters or rivers/lakes with obstacles such as rocks and wood. This is due to heavy duty steel tube frames and pontoons made from abrasion resistant PVC. In terms of comfort, this inflatable pontoon boat has been designed specifically for a single passenger. For this passenger there are adjustable seat and footrests, three different oar-lock positions and a padded fold down plastic chair to sit on. The design of an inflatable pontoon boat means that there is no solid floor. For storage, this boat has multiple storage locations from the rear storage metal container, 10 mesh pockets and 12 zipped waterproof pockets. If you are worried about stability, inflatable pontoons offer great stability thanks to a wide stance design and centered sitting position. The size of this pontoon boat is 108 x 56 x 30 inches and has a maximum capacity of 400 pounds. Overall it is the best one man pontoon boat and is made from heavy duty material for extra durability. The only downside is that is slightly heavy to carry around at 70 pounds but the benefits outweigh the negatives by a country mile. The Sea Eagle 285 is an inflatable pontoon boat for fishing that is 9 feet long and 4 feet wide with a weight capacity of 450 LBS. As its a frameless fishing boat, it only weighs 42 LBS and thats with the floorboard and motor mount included. With such a large weight capacity, you are able to install an outboard motor of up to 3 HP or a trolling motor with thrust up to 55 LBS. In terms of the construction, it uses a 1,000 denier reinforced material and comes with a 3 year manufacturer warranty for peace of mind. For inflation, Sea Eagle include a foot pump, you are better off investing into an electric air pump. Features that are great for fishing include a comfortable swivel seat, 7 inch pedestal for a clear view of the water, multiple rod holders and much more. Overall, it is a good all round small pontoon boat for fishing and offers excellent value for money. The Aquos goes one step further than the Sea Eagle as it has a 0.9mm thick aluminum floor board. For those that prefer a stable floor but do not want to upgrade to a full sized pontoon boat, this is the best solution. In terms of the construction, it has four individual chambers (two of which are reinforced) and the aluminum floor uses non-skid EVA mat for additional stability. As with the mini pontoon boats above, the Aquos can use an outboard motor too but much larger at 6HP. The Aquos is 12.5 feet in length and has a much larger weight capacity at 970 LBS. However, the one drawback to all this is that it weighs 149 LBS, which is fairly heavy if you are planning to transport it frequently. Overall, it is the best mini pontoon boat with an aluminum floor and would be suitable for two anglers to fish from. The Orvis 10-ir model is a stand up fly fishing boat design that allows the angler to stand up for better casting and sight fishing. This is made possible with a unique casting deck and lean bar that deploy and stow easily. In terms of the construction, it is a 1,000 PVC fabric with a tube dimeter of 17 inches. Once inflated, it is 10 feet in length and has a load capacity of 450 LBS. Included is an anchor system and a motor mount to fully complete the package. Overall, it is a unique mini pontoon boat that comes with a 5 year limited warranty for peace of mind. If you like to stand when fishing, this would be the ideal pontoon boat, however the only drawback is that its on the slightly pricey side of things. The Pitt Boss is constructed of a durable polyethylene and unlike the others, its non-deflatable, although it does detach into smaller parts. Pit Boss define this mini pontoon boat as 3 boats in one as it can be used as a trolling boat, row boat and pontoon kick boat. In terms of the design, it has molded in cup holders and various square sizes suitable for a small marine battery, tackle box or even a cooler. Overall, it is a fairly unique one man pontoon boat and can be split up to be suited to a range of different applications. Although its heavy duty, it is surprisingly lightweight at just 35 LBS and can be easily stored in small cars. Pontoon boats are one of the best watercraft to go fishing with, and It comprises two large air bladders either having a metal connection or a curved air bladder. In between these two air bladders is where the angler sits while you guide the pontoon through the water and carry on with fishing. For the metal-frame boats, the seat is attached to the frame whereas, for the frame-less vessels, the type of seats used varies and are either inbuilt inflatable seats or detachable seats. Maneuvering with pontoon boats is excellent with these boats able to slice through the water with ease. Steering these boats, you need two oars which are usually attached to the oarlock which is part of the metal-frame for that is for the metal-frame pontoon vessels or an inbuilt oar lock for the frame-less pontoon boat. 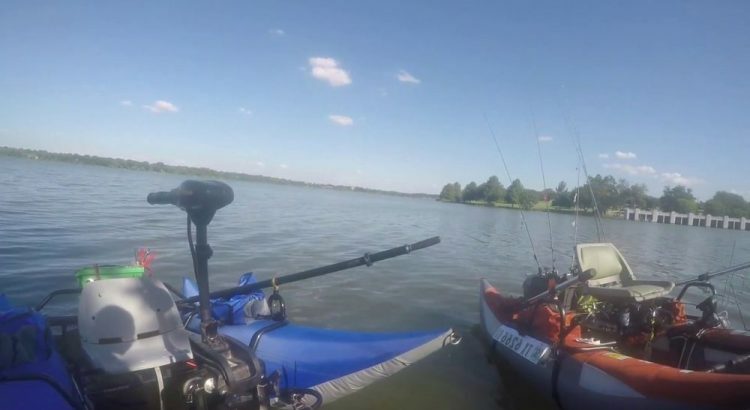 Using the oars, maneuverability is made simple, and at the same time excellent making you enjoy your fly fishing, with pontoon boats specially designed for that. There are numerous pontoon boats available in the market to choose from with improvements being made on ways to offer more comfort and space. However, below are some of the guiding tips you should consider in helping you decide which pontoon boat to buy. Before purchasing the pontoon boat, ensure it has enough space to carry you and all the necessary gear you will need on your fishing trip. Usually, these boats come with a wide range of safe weight carrying capacity which ranges between 300 to 400 pounds. If you are taking the craft for a short day trip, weight capacity is not a real issue, and it only becomes so if you intending to make a long trip necessitating need to carry a lot of equipment, thus needing a higher weight capacity. Nevertheless, it is advisable not to transport your boat’s maximum carrying capacity as this affects the boat’s overall performance. Therefore, the bigger the boat’s weight capacity, the better since it adds versatility when using the boat, a feature you will not regret having. Numerous factors affect the price at which pontoon boats are sold at. However, the two main factors are the boat’s size and locality where the vessel will often be used. Additionally, available features and the level will also have an impact on the boat’s general price. Frame-less one pontoon boats are simple to transport, weigh less, have a higher weight capacity and are relatively straightforward to assemble. However, the main drawback of these frame-less boats over the metal-frame pontoon boats is that they are more costly to purchase. Thus, if you find that at the moment you cannot afford the frame-less one pontoon boat, go for the pontoon boat with a frame. However, it is advisable you save money for a while to afford the frame-less pontoon boat which has additional features, and after using it for a while, you will not regret your decision. Inflatable pontoon boats, also known as catarafts, are another variety of inflatable boats that can be confused with other types. The easiest way to tell an inflatable pontoon boat from others is where you sit. Simply stated, if you are sitting on a platform that is suspended over two large floating tubes, you are probably on an inflatable pontoon boat, with “on” being the operative word. With an inflatable pontoon boat, you are not seated “in” a boat. You are sitting “on” the boat. So much for semantics. Inflatable pontoon boats are great for just enjoying time on the water, especially if you are on a quiet lake or stream. Many makers create them just for fishing and partying. The float tube material used in pontoon boats must be light, and this is particularly important since it allows you to carry more equipment on your boat. Nevertheless, despite the material being lightweight, it needs to be made from durable materials to withstand powder coated metal frames, resist abrasions and general heavy-duty substances. Nowadays it is possible to acquire quality inflatable pontoon boats that are small enough to carry in your backpack. Despite being light, you can carry hundreds of pounds when inflated proving the quality of the boat’s materials. Usually, the pontoon boat’s size influences the ease of setting up and inflating the inflatable pontoon boat. The models that come with frames take up additional time to set up and are bulkier to carry around due to the aluminum and steel rods. Consequently, if you intend to start hiking before getting to the water body, you should purchase a pontoon boat that is frameless since it is less bulky. Most of the inflatable pontoon boats use more or less the same materials about the technology of its elements. At the bottom of pontoon boats, all pontoon boats use PVC material whereas a nylon material covers the top and the sides. For the pontoon boats that have frames, the metal is either aluminum or steel rods with both differing in weight and strength. Majority of inflatable pontoon vessels come with similar accessories. It includes oar holders, detachable storage coolers which you use to store your tiny buckets such as fish holds and ice boxes, not forgetting the fishing rod holders. A pontoon boat having a backrest is critical, and it should be comfy and adjustable. It is particularly important if you often spend an entire day fishing on the craft necessitating you to be comfortable. Additionally, the footrest should be adjustable and comfy as well. One person pontoon boats are easily portable with one person able to carry it with ease. Moreover, these boats are easy to assemble when you want to get to the water body, an activity you can quickly do on your own. Just like drift boats, these boats are specifically designed for fly fishing. It is because these pontoon boats come with the essential features, design and pockets that allows you to fish as you are floating smoothly. Simply put, a quality pontoon boat offers you all the tiny details that ensure your fly fishing day has been fruitful. Despite pontoon boats being great for fly fishing ventures, they also do work well in other water-borne undertakings. All pontoon boats are capable of handling at least Class II whitewater, with other pontoon boats rugged enough able to handle Class III. 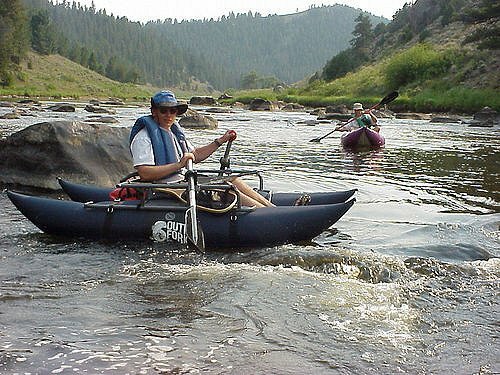 Occasionally, pontoon boats can be used on Class IV whitewater. Just like any product, there is always some drawbacks and the following are not major drawbacks but just some applications where a one man pontoon boat may not be ideal. Unlike inflatable kayaks and rafts which can accommodate two or more people plus their equipment, most pontoon boats are intended to for solo use. Subsequently, anglers needing a large pontoon boat have limited options available because of the few styles of vessel able to carry two people. Therefore, anglers who want a larger boat opt for either drift boats, inflatable kayaks or inflatable rafts. Pontoon boats are not as comfortable in comparison to inflatable kayaks and rafts plus lack the flexibility found in these two type of vessels. Therefore, for a lazy trip down the river, a pontoon boat is not ideal since too much emphasis in its design has been made to best suit fishing. The performance of pontoon boats in whitewater dramatically varies. Almost all pontoon boats are constructed for Class II whitewater thus able to go through strong Class II rapids or feeble Class II rapids. Other pontoon boats of higher quality can even navigate through robust Class III and weak Class IV rapids. However, pontoon boats are not the best for whitewater use in comparison to an inflatable kayak or raft. A one man pontoon boat provides an excellent way of fly fishing with many including specific features that are designed for anglers. The majority are constructed of an inflatable PVC material and have a high weight capacity, which is needed for those wanting to carry all their fishing gear. On top of this, many include a motor mount as you can install a small outboard motor or trolling motor for extra power when out fishing. All of our recommendations cover a range of different styles and suitable for a range of budgets.